For the last few days I was having an issue with my Storage Spaces setup. I have a Two-way Mirror Storage Space comprising of 2 identical SATA-attached HDD drives. However the Storage Spaces in the Control Panel is showing a Warning without giving any explanation of what is actually wrong (no tooltip or anything). In addition, it shows different values for the used capacity! How can that be in a mirrored, identically sized disks? They basically duplicate the what the Control Panel was displaying. However what struck me was that it showed storage efficiency at 73.98%! This should be exactly 50% for my setup. Does it imply then that a substantial part of the data is out of sync then? If so, how can I resync it, making sure it "knows" which data should be used? I have write caching disabled for both drives, so in all cases writes should be immediately reflected on the disks. I did use a Hex Editor with raw disk viewing support to check if indeed it mirrors the data. I tried to find very recent files that I have created in the NTFS MFT using Hex Editor, and was able to do so, with the file records for the new files existing at identical sectors on both drives! I also checked at random locations to see if the data is identical between the drives (sector-for-sector), and it appears to be so. However, I am still unsure if it applies to all data. After all why Control Panel and PowerShell report strange values for % of pool used and storage efficiency? Browse other questions tagged windows-10 hard-drive raid storage-spaces or ask your own question. 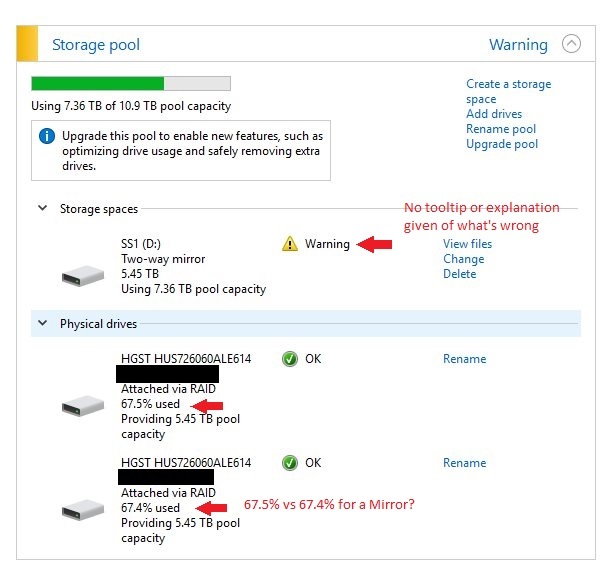 How do I replace a harddrive that is in a two-way mirror storage space on Windows 8? InnoDB + Windows 10 “Storage Spaces” =? Why is StoragePool's OperationalStatus degraded?